Enter Our Summer Kickoff Instagram Photo Contest! Summer is officially here, and we want to celebrate with you! Enter our “Summer Kickoff!” photo contest for a chance to win a pair of hot new Beats by Dr. Dre solo headphones, and show us what you love most about the sunniest season! 1) Snap a pic with instagram of you and your friends enjoying your favorite summer activity, whether it be hiking, biking, swimming, or hanging at the beach—anything that epitomizes what summer means to you! 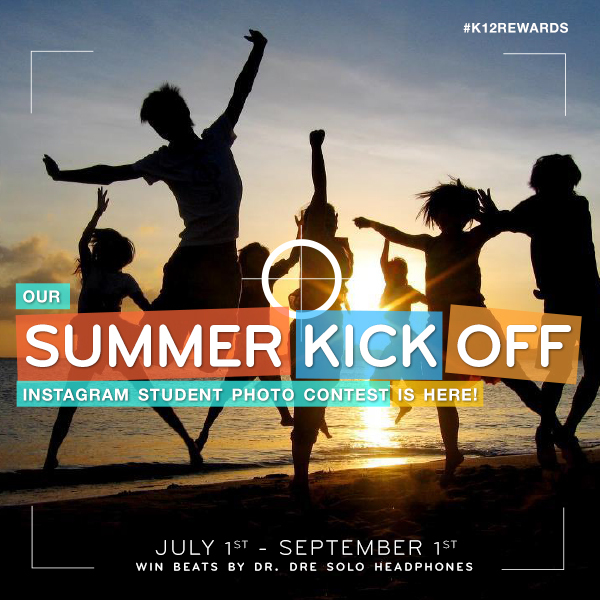 2) Tag your pic with @K12Rewards and be sure to use the hashtag #K12Rewards. 3) We’ll review all your photos, and at the end of the contest, we’ll choose the one that we think is the most original, creative, and best represents the carefree feeling of summer. We’ll post the winner on our Twitter and Facebook pages, so make sure you’re following us! The winner will receive a pair of Beats by Dr. Dre solo headphones. The contest will be live from July 1-September 1. All photos submitted must be original photos, and users can only submit one photo per person. To be considered, all photos must have @K12Rewards and the hashtag #K12Rewards in the caption.